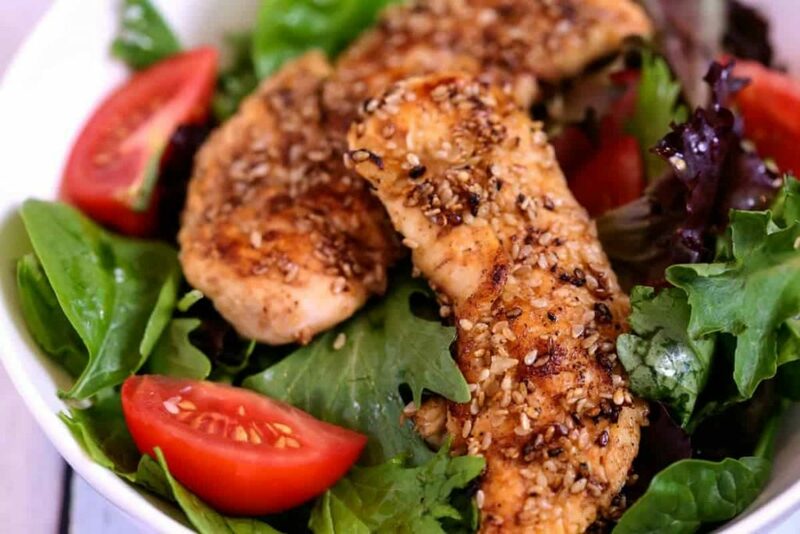 You’ll love this recipe for Sesame Chicken Salad with a fresh ginger-infused vinaigrette. And, the fact that it’s heart healthy is an added bonus! Summer is right around the corner and you know what that means—swimsuit season! I don’t know about you, but it’s a real moment of truth for me to go swimsuit shopping. Suddenly, I start to regret all those times that I planned to exercise and didn’t…or had just one more cookie! Bring on the salads! 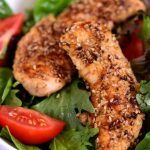 For some people—like my husband— it can get a bit monotonous having salads every day, so I love finding recipes for creative salads to mix it up a bit for our family. This Sesame Chicken Salad is a pretty basic recipe, but with an Asian flair. This salad’s three-ingredient vinaigrette has minced fresh ginger and no added salt or pepper—it’s just not needed when combined with the sesame chicken and other salad ingredients. If you’re like me, you automatically assume that you should add salt and pepper to all foods. I’m learning that’s just not true! 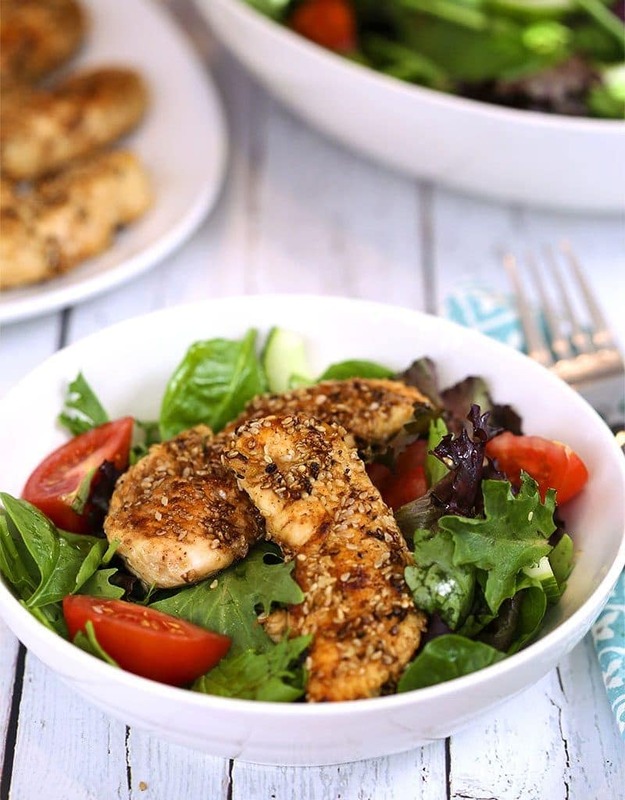 Since time is involved in cooking the chicken for this salad, I like using pre-packaged mixed salad greens to make the rest of the process go a little faster. Just add fresh veggies (tomato wedges and sliced cucumbers) and it’s all ready for the beautiful sesame chicken. 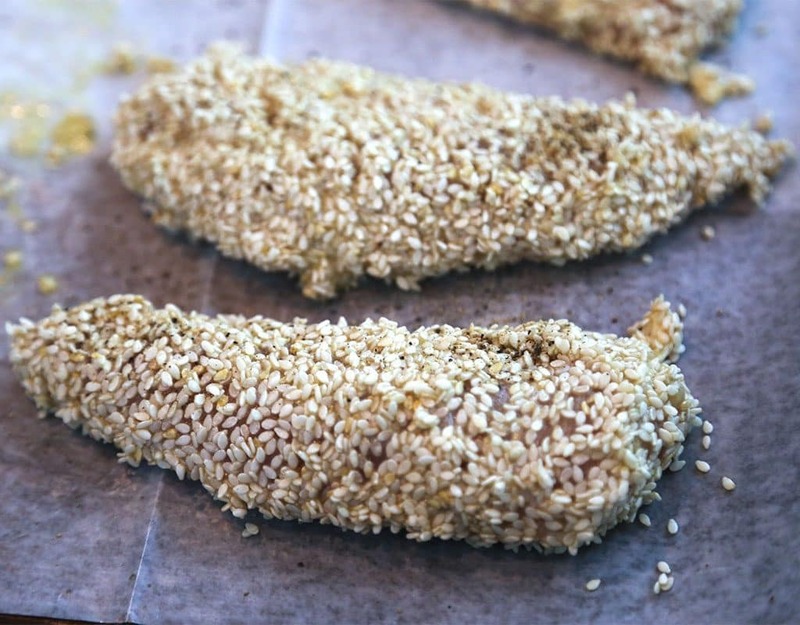 The marinated chicken tenders are dredged in sesame seeds and sautéd in olive oil until lightly browned on all sides. I found that this process can be a little bit messy. I was surprised when the sesame seeds started to pop when they hit the hot skillet! You’ll lose a lot of the sesame seeds in the cooking process, but that’s okay. Enough will remain so that the chicken still has a nice bit of crunch. To assemble the salad, simply toss the greens with the tomato and cucumber and the ginger vinaigrette. Top with the sesame chicken and serve. 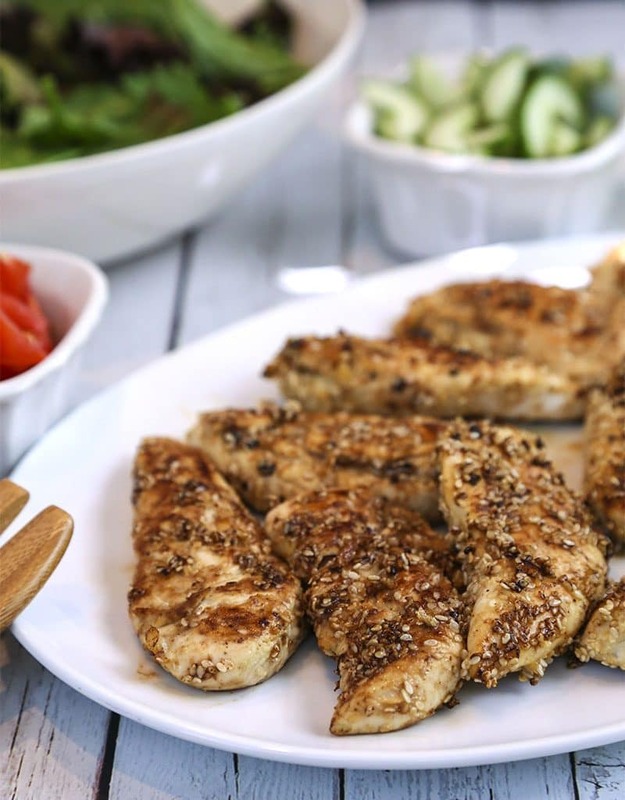 You'll love this recipe for Sesame Chicken Salad with a fresh ginger-infused vinaigrette. And, the fact that it's heart healthy is an added bonus! In a small bowl, whisk together the canola oil, rice wine vinegar, and freshly minced ginger. Season with black pepper to taste. Cover and set the vinaigrette aside to allow the flavors to bloom. Mix together the Dijon mustard and maple syrup and pour over chicken in a ziplock bag. Seal and refrigerate for at least one hour. Over medium high heat, heat olive oil in a large non-stick skillet. Sauté chicken in batches for about 2 minutes per side, or until cooked through, adding more oil if needed, a tablespoon at a time. Transfer the chicken to a plate. 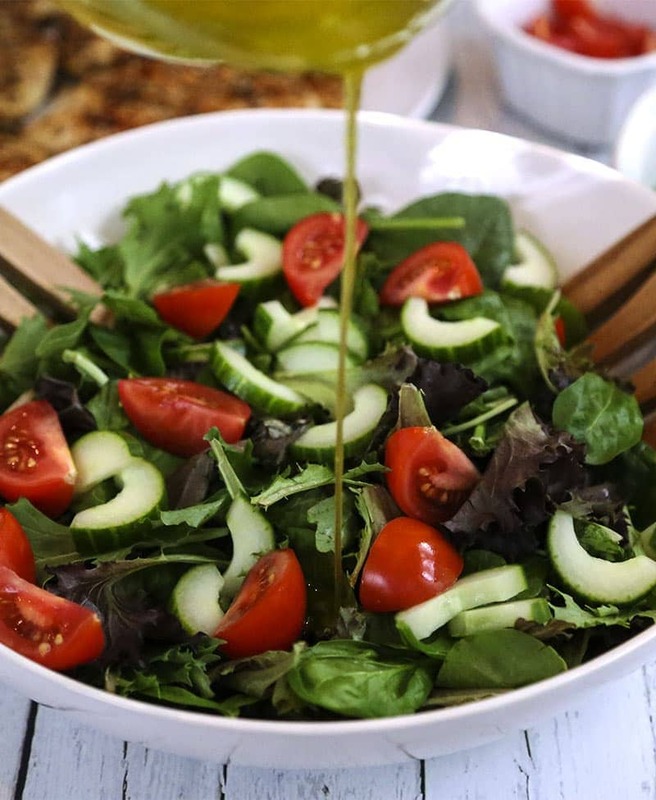 Prepare the salad by tossing the mixed greens with cucumber (seeded and sliced) and tomato wedges. Pour on the vinaigrette and toss again gently. Top with the sesame chicken and serve.